Chinese President Xi Jinping’s visit to Europe has injected new impetus for expanded China-Europe cooperation. Italy and China signed a memorandum of understanding (MOU) on the Belt and Road Initiative (BRI) on Saturday, which is considered a landmark event. Global public opinion analyses the event from such a perspective: Italy is the first G7 country to join the BRI. Italy’s participation further proves the BRI’s attractiveness. Before Italy, 123 countries and 29 international organisations have signed cooperation documents to jointly build the BRI. These sovereign states believe the BRI furthers their development and prosperity. 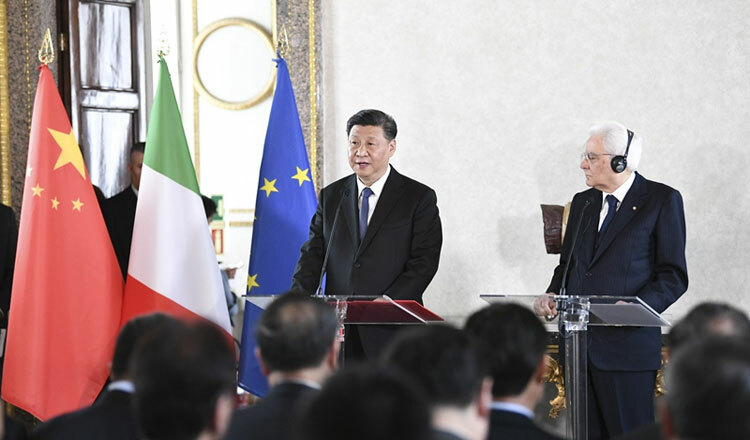 Italy’s current government prioritises its interests, China-Italy cooperation is the result of their strong mutual benefits. Washington has been publicly opposing Italy’s endorsement of the BRI. Some Western people said it shows US influence is declining while China’s is rising. Critics said Italy has allowed China’s influence to reach Europe. Some even exaggerated, saying Italy has turned itself into a “Trojan horse”. These outmoded thoughts are only misleading the US and disturbing some Europeans. The BRI is about cooperation. For Italy, it’s a chance to revive its port and serve as a new economic driving force. Compared to other Western countries, Italy’s economic cooperation with China lags behind. All parties concerned should be happy for Italy as the country has taken a new step in foreign cooperation. This should be the way friends should act like. China is Europe’s long-term partner. Although competition exists between the two, such competition is the fairest and simplest Europe has ever experienced. China-Europe cooperation is voluntary and reciprocal. China consults with the EU if there are any problems. Compared to negotiating with the US, Europe will feel much more respect and amity when consulting with China on trade disputes. China supports a united and strong EU and embraces reciprocity. China will never pursue “China First”. The two sides can explore ways to achieve mutual benefits, and China welcomes such consultations. Europeans don’t need to worry about Italy’s embrace of BRI. They should consider it a major European country’s experiment in strengthening cooperation with China. The BRI is a bridge to further prosperity. Our world is not based on geopolitical rules. It is destined to be more colourful after the 21st century. Some Europeans are concerned that China’s rise will hurt Europe. But such concerns won’t benefit Europe. Competition always exists, and as a continent that started the Industrial Revolution, Europe should have confidence. Europe still leads China in technology. Instead of expecting China to stop its development, Europe should move faster.